Rev. Edmond F. Adams, 98, of Fort Dodge passed away Monday, October 22, 2018 at the Paula J. Baber Hospice Home. Funeral services will be 11:00 a.m. Monday, October 29, 2018 at Sacred Heart Church with Most Reverend R. Walker Nickless Bishop of Sioux City Diocese officiating the Mass of Christian Burial. Burial will follow at Corpus Christi Cemetery. Visitation will be on Sunday from 3:00 to 5:00 p.m. at Laufersweiler-Sievers Funeral Home, with a Rosary at 5:00 p.m. at the funeral home. Edmond Francis Adams was born November 8, 1919 in Fort Dodge, Iowa to Raymond and Katherine (Brenner) Adams. He attended Sacred Heart School. After graduation, he attended college and seminary at Trinity College, Sioux City. Ed then enlisted in the United States Navy and served during WWII. After his honorable discharge he returned to college and attended Loras College, Dubuque then St. Louis University, St. Louis, Missouri. Lastly, Ed attended St. Mary Seminary, Baltimore, Maryland to finish his seminary study. On June 7, 1952, Edmond F. Adams was ordained in the Cathedral of the Epiphany, Sioux City. Reverend Father Edmond first served as the Assistant Pastor at Immaculate Conception, Sioux City. In 1954, he became an Assistant Pastor at St. John the Baptist Parish, Bancroft. In 1958, Fr. Ed served as the Assistant Pastor at SS. Peter and Paul Parish, Carroll. He was the Pastor of St. John Parish and served Saint Patrick's on the Lizard from 1960-1963. He served on duty outside of the Diocese from 1963 to 1972 as a missionary priest in South America for the Society of St. James the Apostle. 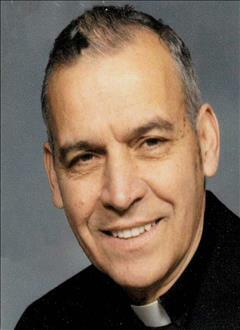 He was Vicar Adjutor and Pastor of St. Joseph's Parish in Wall Lake. In 1974, Fr. Ed was the Pastor of St. Mary's Parish in Larchwood and his final assignment was Pastor of St. Mary Parish in Hawarden. In 1994, Fr. Ed retired and made Sacred Heart in Fort Dodge his home. He preceded in death by his parents and five siblings. Father Adams married my Husband and myself in 1989. He also was there the night before my husband passed away 6 years later. I always said we were truly blessed to have father there in the beginning of of marriage and at the end of our marriage. Truly a great gift from God. I still have the Bible he gave us when we married. Father Adams was a wonderful and special man! He was a very good friend to our family during the time he served in Hawarden. I especially remember how special he made the Easter Tridium and how he made Holy Saturday almost as important as Easter! I’m so honored and privileged to have known him for a brief time, and glad that he was the priest that married my husband and I. Pax Fr. Adams. Rest in Him! "Father Adams and I became close friends when we both served as missionaries in Andahuaylas, Peru in the late 1960's. We both learned enough Spanish to communicate effectively with the Spanish speaking local residents. However, over 50% of the residents spoke only the native Indian language which was Quechua. Fr. Adam choose to serve the Quechua people and to communicate with them he used his big heart and his big smile. And, his daily acts of Christian charity were understood by all the people especially those living in the high remote mountain ranges. His only mode of transportation was by horseback." Fr. Adams With Jeanne & Hassan Tajvar on their wedding day. The attached photos are added to the memorial of Fr. Ed Adams to help share their legacy. Please help memorize Fr. Ed Adams by recording your attendance below.